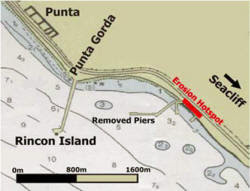 BEACON is the lead agency on a proposal to construct an artificial surfing reef at Oil Piers. 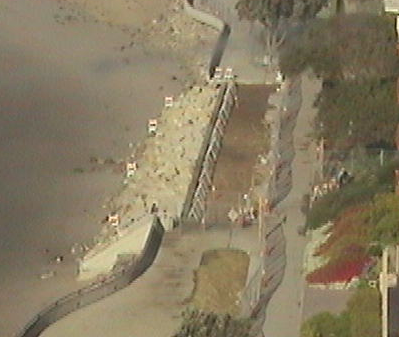 This is idea that originated when the piers were removed in 1998, causing loss of the surf break. At that time, Stanley's Reef Foundation was formed to promote a reef constructed from PVC pipe. USACOE contracted with ASR Ltd to develop a preliminary design for an offshore reef that will create a stable beach through wave rotation and energy dissipation. The proposed structure will consist of submerged sand-filled containers placed offshore of the beach. 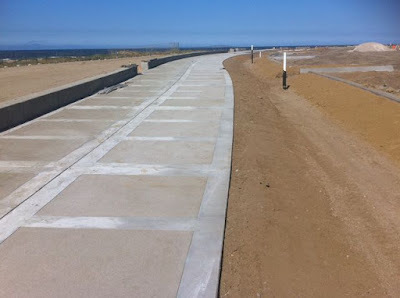 In the past decade, ASR has constructed several sand bag reefs around the world, with limited success. 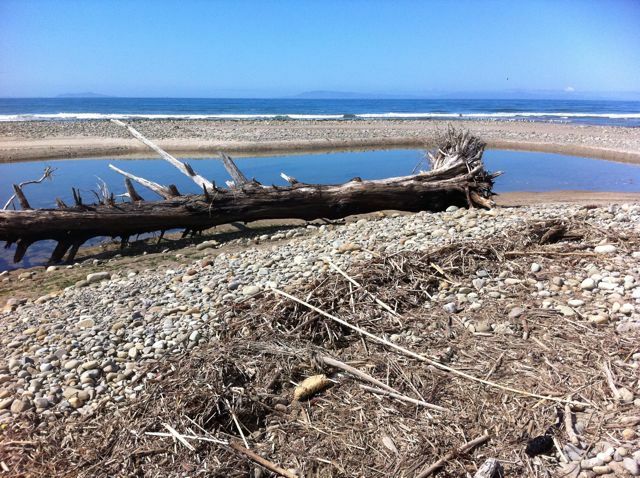 In most cases the local surf communities have rejected the reefs' inability to create a surfable wave. Most recently, ASR has proposed using rocks to augment the sand bags in the New Zealand reef. BEACON staff are currently working with the USACOE and ASR Ltd Team to deliver a new project design. Depending on federal funding, the goal is to have the project constructed in 2012. 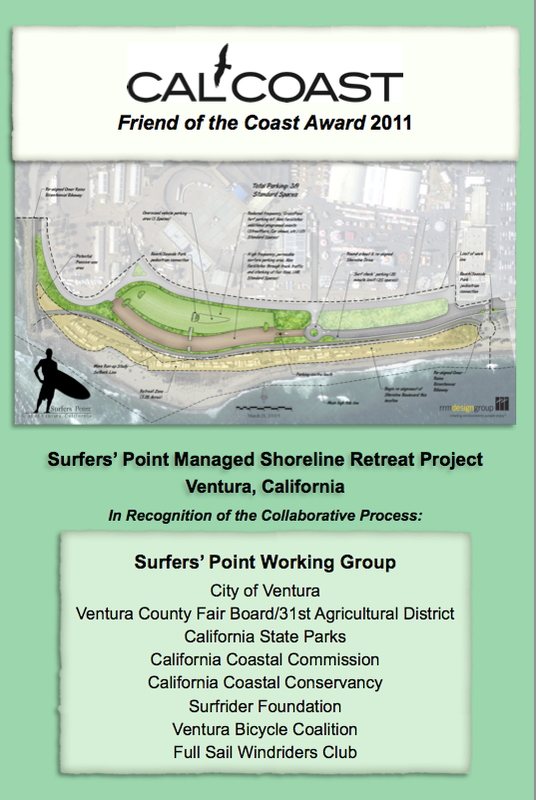 Meanwhile, BEACON completed environmental documents proposing at least five of these structures for the Santa Barbara/Ventura coastline. 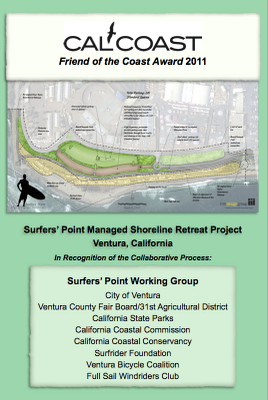 Surfrider commented that it may be premature to plan these other projects until we can demonstrate success at oil piers. More commentary from Surfrider: Do artificial reefs work? A similar presentation with a fish-centric message was part of the plenary session for the annual Salmonid Restoration Federation conference in March. 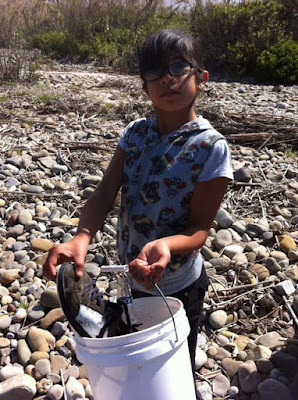 The same message will also be presented this week in San Diego at the Headwaters to Ocean (H2O) Conference. 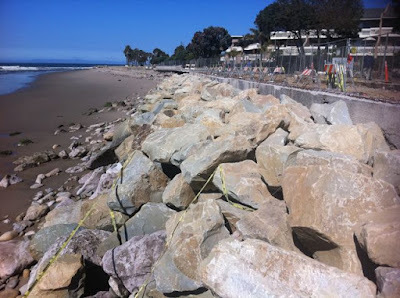 Repairs are in progress on the Ventura Promenade. The seawall and stairs have taken a beating, and much of the rebar internal to the concrete structure is in a state of decay. 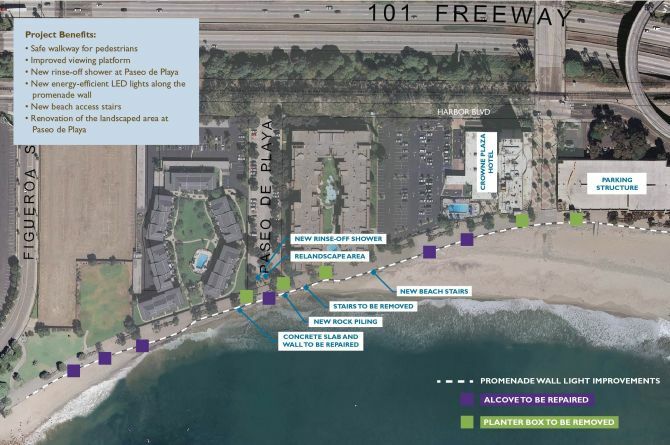 We are concerned that the Negative Declaration does not adequately consider impacts to public beach access and recreation associated with the rock revetment and new stairs. First, the design drawings show the rock revetment extending out at least 20 feet onto the existing recreational beach. 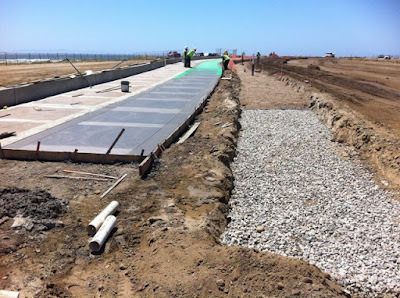 It is not clear that this structure was originally built to such a large scale, and we are concerned that the revetment placement will reduce the existing width of the recreational beach. Construction of structures like this often results in what is termed 'placement loss,' where the public beach is effectively covered up by the placement of rocks. This is evident in the aerial image. 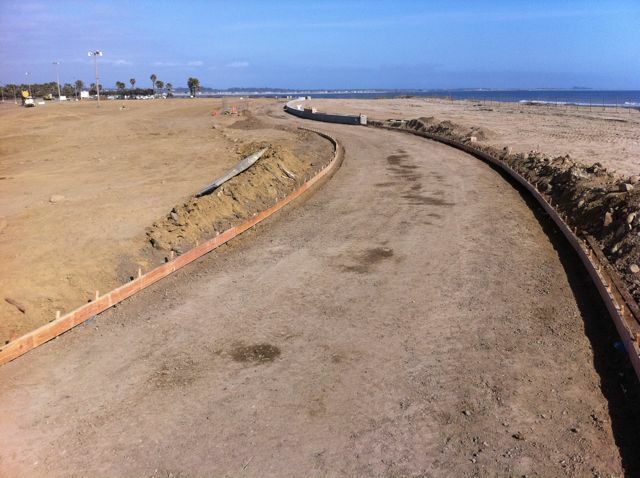 Work continues at Surfers' Point, with the new bike path beginning to take shape. 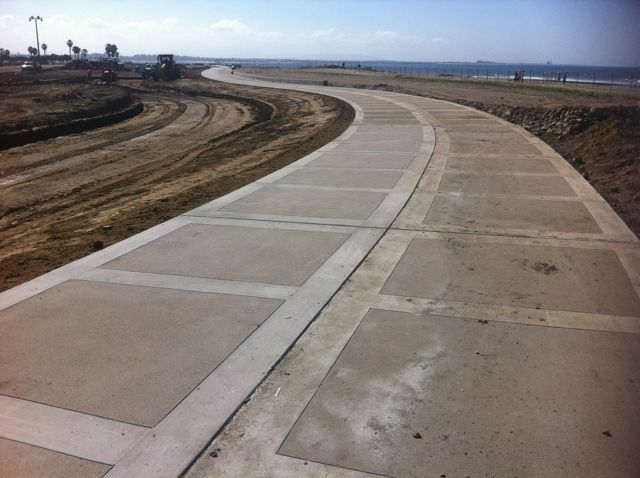 The concrete bike path is designed with a textured pattern, and will eventually connect with the promenade at Surfers' Point. Below is the view from the east end, looking back toward the river. The gravel area is a permeable 'bioswale' that will be planted once the construction is complete. The bioswale is designed to capture runoff from the bike path and half of the new parking lot as shown in the drainage plan below. 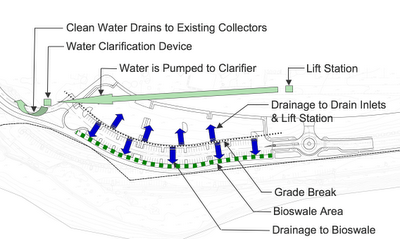 For more info see this description of how a bioswale works. The Once Upon a Watershed (OUW) program provides hands-on watershed education, restoration, and stewardship opportunities to 4th -6th grade students in the Ventura River Watershed. 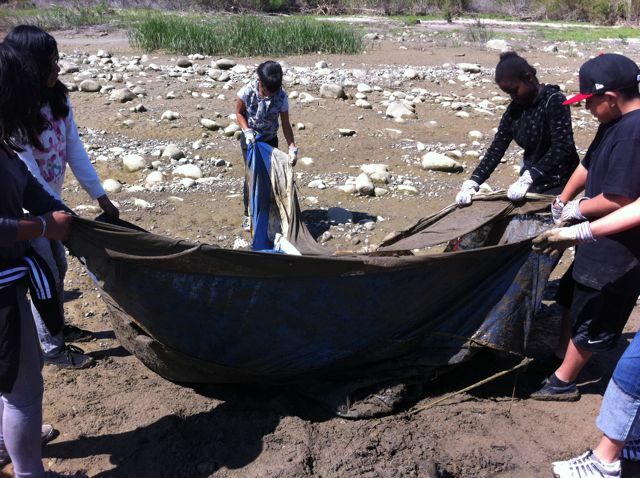 The program was featured in Watershed Revolution. 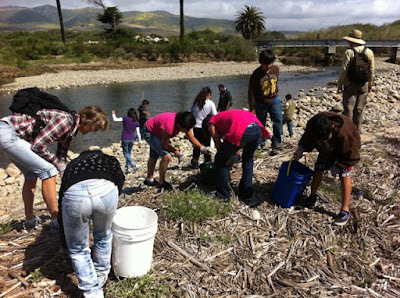 Once Upon a Watershed is the only watershed-specific environmental education program available in local schools, and provides one of the only pre-paid opportunity for teachers to get their students out on field trips. Throughout the course of the 3-year program, students learn about a diversity of topics in the natural sciences, including oak ecology, watersheds, and river processes through in-class presentations and field trips. 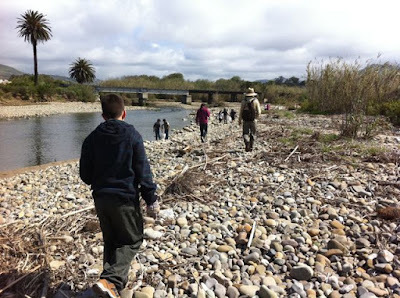 Students get the opportunity to take field trips to places such as the Ojai Meadows Preserve, Confluence Preserve, Ventura River mouth, Foster Park, and various other spots along the Ventura River. 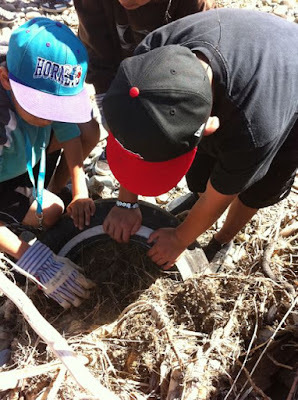 On all field trips, students are given the opportunity to contribute to real ongoing restoration projects, often by planting native plants or picking up trash. In this way, students are empowered to help restore our open spaces. 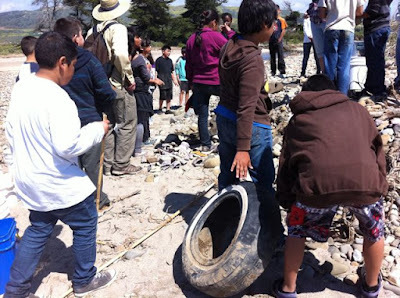 On a recent field trip to the mouth of the river I asked the students if they knew what Surfrider does. One student said "Scoop the Poop!" This is a quote from "Sea to Summit", a video produced by the Surfrider Foundation and shown in the classroom part of the program. I think they were stoked to have a real 'Surfrider' talk to their class at the beach! Last month Once Upon a Watershed was informed that their 3-year federal grant has been withdrawn after the first year - a victim of the federal budget cuts.